On the re-write segment of his show on MSNBC last Monday, August 1st, Lawrence O'Donnell once again pushed the idea that "we are all socialists now." Except he's not socialist, as will be made clear below; and Glenn Beck has made it clear that he's not any part socialist. Beck's propaganda against the political progress that protects the public interest against the private abuses of corporations demonstrates that Beck is a reactionary extremist. If fact, he does not hide the fact that he's an extremist. This re-write segment ends with a brief reference to Glenn Beck. Via MSNBC, watch this segment entitled "Bill Maher's re-write on socialism:"
at the thought of seeing this woman naked. There's a more serious point to be made here. Beck has convinced millions of his followers that the Social Security Insurance system and the Medicare Insurance system that they have been paying into for years is bad for their "freedom." Beck wants to help lead the country back to the political economy of the 19th Century when corporations had free reign to monopolize industrial sectors, violently break up attempts by workers to organize a union to bargain collectively for better working conditions and higher pay and to -- as O'Donnell points out -- treat the environment we all need to survive on as their private waste dump. Beck supports pure capitalism and hates government programs that help people survive and live with dignity. He never spells out the consequence of his ideal of "freedom," but it would lead to ecological collapse, homelessness, starvation and early death for senior citizens, at least the millions of those who are missed by Beck's ideal of private charity, charity that always shrinks during economic downturns when it is needed the most. It has been pointed out previously here that even conservative Republican President Eisenhower considered people like Beck in his day to be "stupid." In Eisenhower's time their numbers were negligible, but because Beck is such a convincing propagandist, he has managed to get millions of gullible and "conservative" Americans to act and vote against their own self-interest and for the interests of Wall Street and corporate fat-cats, millionaires and billionaires like Beck and the Koch brothers respectively. We are all riding the horse now. O'Donnell really is not a socialist. He even says that we do not want a purely socialist economy; we have and he supports a mixed economy. That's not socialism, the nearly most extreme lower left position on the political mandala (below), just shy of communism. The political philosophy of a mixed economy is progressivism, not the progressivism that liberals (pro-corporate reformers) have decided to call themselves because the likes of Ann Coulter and Rush Limbaugh have demonized the word "liberal." O'Donnell is an old fashioned progressive along the lines of President Theodore Roosevelt, President Woodrow Wilson, President Franklin Roosevelt and President Lyndon Johnson, the presidents that Beck loves to hate. 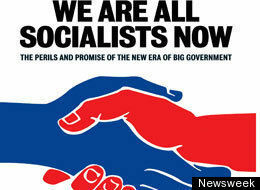 They were not "socialists;" they were men who embraced private enterprise like cowboys embrace horses. Like cowboys, progressives have regulated the wild horses of capitalism with saddles, stirrups, reins and bits. They were riding the "horses" of their respective eras, and the horses were brought under control and made safer to ride as a consequence of the progressive legislation passed during their Administrations. We are all riding the horse now. That is unless Glenn Beck has his way and the extremist Tea Party strips the horses of the equipment that makes horseback riding safe and enjoyable (for the riders, not the horses). Then we would all be on a wild ride that could well take us down the road to socialism, the socialism that is not far from the communism on the far lower left of the political mandala as displayed here, the pure socialism that O'Donnell does not consider a good idea. One final note about this mandala as depicted. Obama is positioned where progressive candidate for president, Senator Obama would be positioned. 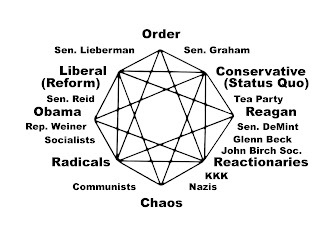 President Obama has governed much further up the spectrum as a corporate liberal, much closer to Senator Lieberman. Likewise, Reagan is positioned where regressive candidate for president, Governor Reagan would best belong. President Reagan governed much further up the spectrum as a corporate conservative, much closer to Senator Graham as described here. On the lower right, Glenn Beck actually overlaps with the John Birch Society. He is a race-baiting, neo-McCarthian reactionary, farther down the mandala than even candidate for president, Governor Reagan is shown and in the bed next to, but not quite in bed with, the Ku Klux Klan. Oink, oink!